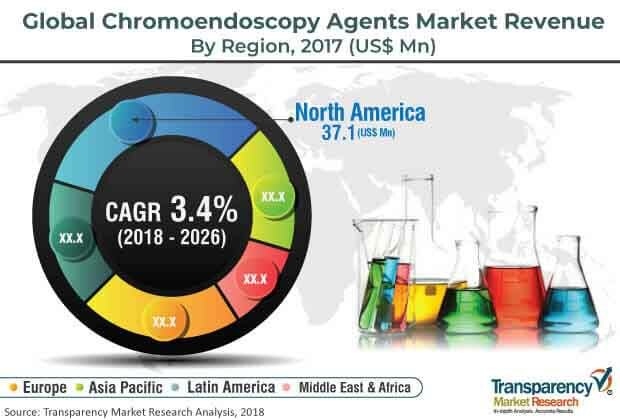 Transparency Market Research (TMR) has published a new report titled, ‘Chromoendoscopy Agents Market - Global Industry Analysis, Size, Share, Growth, Trends, and Forecast, 2018–2026.’ According to the report, the global chromoendoscopy agents market was valued at US$ 108.9 Mn in 2017 and is projected to expand at a CAGR of 3.4% from 2018 to 2026. Rise in prevalence of gastrointestinal diseases, increase in the geriatric population, and surge in awareness about advanced imaging techniques are factors anticipated to drive the global chromoendoscopy agents market from 2018 to 2026. The incidence and prevalence of gastrointestinal (GI) diseases across the world are increasing at a rapid pace, affecting millions of people. According to the World Gastroenterology Organization (WGO), prevalence of gastro esophageal reflux disease (GERD) is approximately 15% to 25% across the world. Moreover, according to the American Institute for Cancer Research, colorectal cancer is the third most common cancer in men and second most common cancer in women. In 2018, around 1.8 million new cases of colorectal cancer were reported across the globe. Increase in incidence of gastrointestinal diseases is expected to be a major factor likely to augment the global chromoendoscopy agents market. Chromoendoscopy, particularly in combination with magnifying endoscopy, has helped health care professionals in the detection of neoplastic lesions in the gastrointestinal mucosa, specifically in ulcerative colitis and Crohn’s colitis. Chromoendoscopy is helpful in the upper gastrointestinal tract, primarily in evaluating Barrett’s oesophagus (BO) for the presence of dysplasia. It also improves visualization and detection of suspicious lesions, and helps to define the extent of neoplastic lesions that may be responsive to endoscopic resection. Such advantages associated with chromoendoscopy over conventional white light endoscopy are expected to contribute to market growth. Moreover, favorable medical reimbursement policies for different endoscopy procedures in developed countries such as the U.S., Australia, New Zealand, the U.K., and Germany have enabled most people affected from gastrointestinal diseases to opt for effective endoscopic procedure. These reimbursement policies have significantly driven the revenue of leading players in the international market. The report offers detailed segmentation of the global chromoendoscopy agents market based on product type, application, end-user, and region. In terms of product type, the absorptive agents segment is anticipated to account for high market share due to increase in applications of absorptive agents in visualization & detection of neoplastic lesions, presence of dysplasia, and promising results of absorptive stains in the diagnosis of gastrointestinal abnormalities. The hospitals segment is projected to account for leading share of the market by 2026. The segment is anticipated to grow at a rapid pace during the forecast period. Hospitals are equipped with all the equipment and consumables required for chromoendoscopy. Moreover, presence of skilled professionals and ability to handle numerous operations at one time are expected to drive the segment during the forecast period. North America held major share of the global market in terms of revenue in 2017 and is projected to sustain its position during the forecast period. High awareness about latest health care technologies and higher purchasing power are anticipated to boost the chromoendoscopy agents market in North America. Favorable reimbursement policies in the region also enable patients to avail the best health care facilities. Europe is anticipated to be the second largest market in terms of share and revenue during the forecast period. Developed health care infrastructure in the region has helped patients undergoing chromoendoscopy in covering their expenditure. Most health care providers in countries such as Germany, the U.K., and France provide full or partial coverage of costs related to treatment, medication, physicians cost, and tests depending on the patient’s insurance plan and income. The report also provides profiles of leading players operating in the global chromoendoscopy agents market. These include Sisco Research Laboratories Pvt. Ltd., HISTALIM, Merck KGaA, Thermo Fisher Scientific, Inc., and LobaChemie Pvt. Ltd.